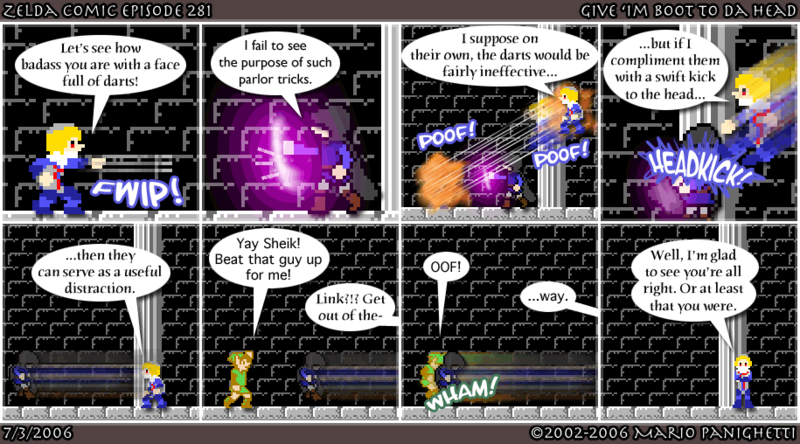 This comic took a little longer than I’d wanted, on account of needing to make new poses for Sheik and The Miscreant. Oh yeah, and going off to see An Inconvenient Truth. If you see only one Keynote-based movie this year, consider that one! I must say, that Sheik fellow looks awesome when jumpkicking. Kick. Kick. This entry was posted on Monday, July 3rd, 2006 at 12:00 am and is filed under Comics. You can follow any responses to this entry through the RSS 2.0 feed. You can leave a response, or trackback from your own site. AND ANOTHER FOR LINK AND THE ANGEL!